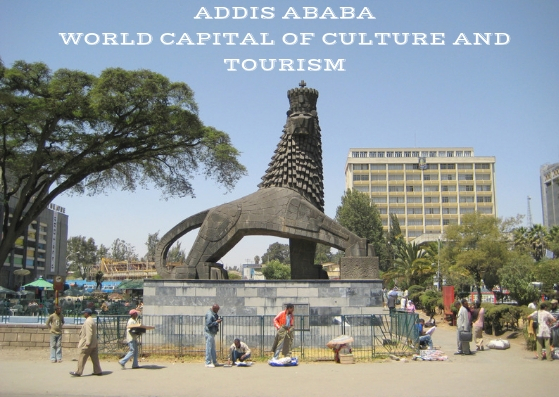 Addis Ababa is opening the gates of an ancient and mystical world, and was recently named WORLD CAPITAL OF CULTURE AND TOURISM by the ECTT-global tourism institution and today the megapolis is preparing to welcome an increased number of tourists transforming it in the main tourist capital of Africa. In 2015 after the country was elected as WORLD`S BEST TOURIST DESTINATION of the year an estimated 1 million tourists visited the African nation. In order to help tourists discover what the global tourism institutions calls a perfect city for tourism, discovery and culture lovers we have gathered in a pocket guide the main highlights of this buoyant African capital, the political center of Africa Union, the host to UN Economic Agency for Africa and by now the European Council on Tourism and Trade registered WORLD CAPITAL OF CULTURE AND TOURISM. 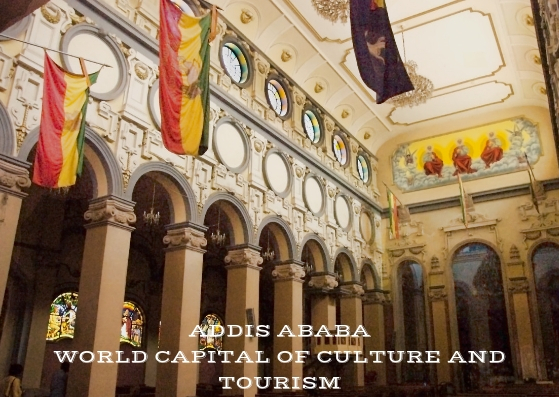 ADDIS-ABABA: A CITY IMBUED WITH HISTORY. Kidus Raguel church on Entoto: a testimony of the 550 years of political existence of Addis Ababa. 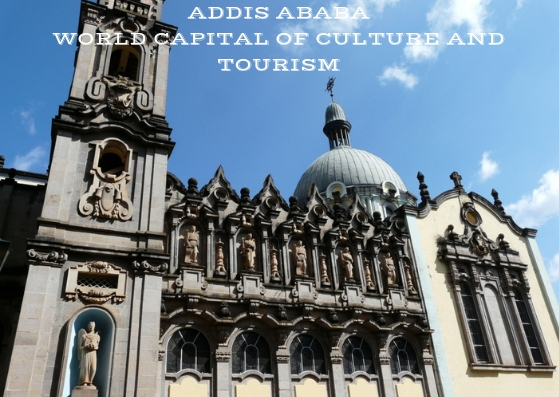 In 2019 and 2020 Addis Ababa is celebrating 550 years of historical continuity starting with a medieval presence in the Entoto Hills above Addis Ababa confirmed by the existence of the ruined rock-hewn churches of Washa Mikael and Kidus Raguel. The hills also host the city’s oldest functioning church, Entoto Maryam, a traditionally painted octagon perched on the site where Emperor Menelik II was crowned in 1889. Emperor Menelik II, the father of modern Addis Ababa, adorned the city with a host of religious monuments like: St George’s Cathedral later served as the coronation site of Empress Zewditu and Emperor Haile Selassie. Selassie (Trinity) Cathedral, with its intricate facade, is where the famed Emperor Haile Selassie has been laid for his final rest. St George’s Cathedral build in honor of the Adowa victory (1896) over Italian imperialism, victory that market the survival of Ethiopia as an independent African nation. Nearby Church of Beata Maryam, noted for its beautifully painted interior, hosts the subterranean mausoleum of Emperor Menelik II and Empress Zewditu. Other examples of religious architecture include the beautiful early 20th century Anwar Grand Mosque, and the gracious Armenian and Greek Orthodox Churches on the Piazza. 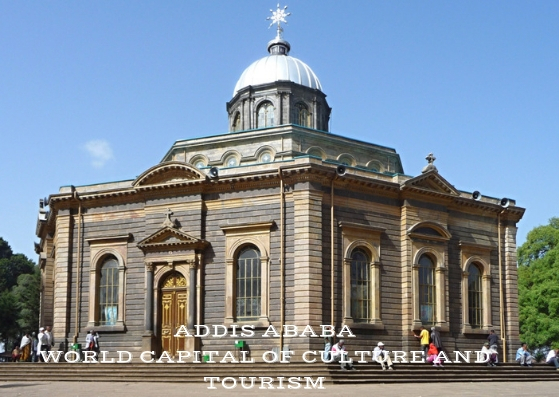 Built to commemorate Ethiopia’s emancipation from the Italian occupation, the cathedral is an important focal point for the Ethiopian Orthodox church. As a place of worship, it is considered second only to the Church of Our Lady Zion in Axum (where the original Ark of the Covenant is believed to be held). The site where Menelik II established his capital, Entoto mountain offers excellent views across the Addis Ababa and its surroundings, and a breath of fresh air after the hustle and bustle of the city. Visit Menelik II’s palace, the church of St. Mary and the Entoto museum. Following Menelik II’s victory over the Italians at Adwa, he ordered the construction of this cathedral in honor of St George, whose flag he had carried on the battlefield. The cathedral was rebuilt in the early 1920s under Emperor Haile Selassie. St George continues to be considered patron and savior of the nation. The museum holds many exhibits related to the cultural traditions of the Ethiopian Orthodox Church. 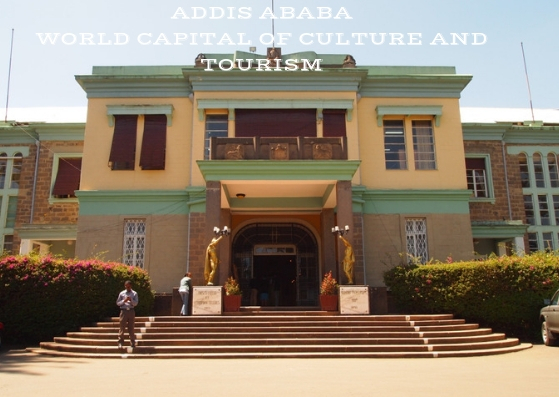 Ethnographic Museum of Ethiopia housed in the ancient Emperors palace from Addis Ababa play host to a treasure trove of historical collections. The oldest museum in Ethiopia, its most famous exhibit is “Lucy”, the 3.5 million-year-old skeleton whose discovery in 1974 demonstrated that bipedal hominids evolved much earlier than previously thought. The museum also holds many other palaeontological and archaeological artifacts, as well as ethnographic and modern art displays. Housed in Emperor Haile Selassie’s former Palace, this museum is dedicated to preserving the traditional art, languages and cultures of Ethiopia’s many ethnic groups. This quirky museum contains every design of Ethiopian stamp from 1894 to the present day, including many of the artist’s original drawings and proofs. The designs reveal a huge amount about the country’s past economic, political, social and cultural life. 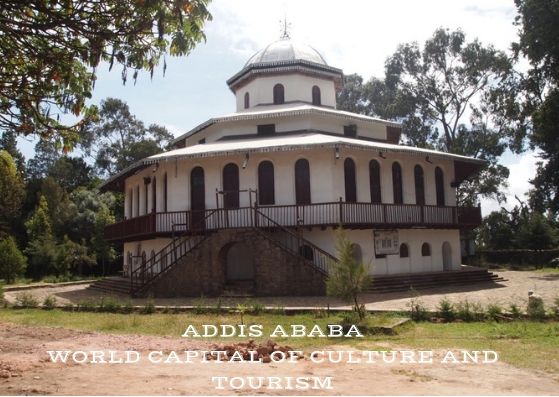 Housed in one of the oldest buildings in the city, which was originally home to one of Menelik II’s warlords, this museum charts the history of Addis Ababa from its foundation in 1886, through to the present day. Part of the Natural Sciences department of Addis Ababa University, this museum intends to serve as a reference collection of all animal species of Ethiopia. Yeut no? Where is …?